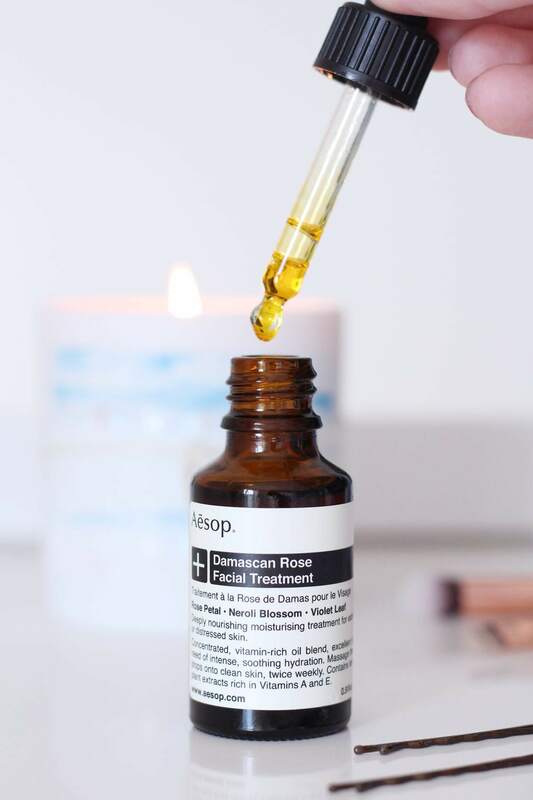 On my quest to find ultra hydrating skincare for my Roaccutane complexion, I pretty much zone in on anything containing the words ‘nourishing’ and ‘moisturising treatment’, so it’s no surprise I ended up with the Aesop Damascan Rose Facial Treatment. I actually went into Selfridges looking for the Odacite Moringa and Petitgrain Serum Concentrate for Very Dry Skin (review here) which I’ve used before and loved, but I couldn’t find it anywhere, so I ended up at Aesop which was turned out to be a wonderful decision. Unfortunately we don’t have a counter up North, so it was nice to browse everything as I do love their packaging and scents. I settled on this oil (and mentally about half of their stock for later purchases) as the description seemed to fit my needs perfectly and, although the staff were too busy to come over and help, the girl at the till assured me it was the best one. The Aesop Damascan Rose Facial Treatment (here) is an ultra hydrating and soothing blend of oils designed to give your skin a hydration boost when it needs it. It contains rose petal, neroli blossom and violet leaf which offer a dose of vitamins twice a week if you’re a normal person, or twice a day if you’re me with sahara-desert skin. I’ve found it to be quite a light, silky oil in texture and when you’re massaging it into skin, but it packs a serious hydration punch, ensuring my skin is hydrated as well during the day as it is overnight. The bottle is a decent size at 25ml (compared to the £33 5ml option I originally went in for) so I can imagine it’ll last me a couple of months while I come to the end of my treatment. Overall, it’s beautiful to use, instantly soothing and is doing a great job at keeping my dry skin at bay so it’s been the perfect introduction to the treatment side of this brand so far! Have you tried the Aesop Damascan Rose Facial Treatment or any other Aesop skincare? ps. Remember to enter my instagram beauty giveaway!